On 3rd March this year a colossus retired from the game, leaving the cricket world bereft of yet another batting great. Along with Brian Lara, Ricky Ponting, Rahul Dravid, Inzaman ul-Haq, Jacques Kallis and Sachin Tendulkar, Graeme Smith leaves behind an era of extraordinary batting achievements. It was an era which irrevocably changed the norms that defined a willow wielding giant. Test matches played, runs amassed and averages attained would make it appear as if modern batsmanship were all of a sudden a mutant, genetically modified facet of the game, renderering puny the totals eked out by the greats of previous decades. As Ben Bloom observed in the Daily Telegraph “10,000 career Test runs became the new 8,000. 30 career Test centuries became the new 20″.There was much more to it than that, of course. The game had changed for sure, but Smith remains unique in the modern era. Ascending to the captaincy at the age of just 22, he made his runs as an opening bat, carrying the attack from the off. To fully appreciate his impact it is necessary to delve back into the mists of the not too distant past of South African cricket. The late nineties and early noughties were particularly dark times for the Proteas. After their incredible return to the international fold in late 1991 they had worked up such a head of steam that anything seemed possible. Not for them the agonising and occasionally humiliating apprenticeships suffered by Sri Lanka, Bangladesh and Zimbabwe. This was no joke outfit, merely there to make up the numbers and give the big boys of the international game a much needed fillip to their averages. This was not a team to play a cursory Test or two at the beginning of a summer before the serious business began. Not one bit. From the moment Clive Rice and his men made that emotional and long awaited return to the international fold in late 1991 South Africa was ready for the fight. Then came the Cronje allegations which, nightmarishly, turned out to be true. Although there was no paucity of talent produced by the South African game, the match fixing scandal and Cronje’s subsequent death in a plane crash in 2000 created a crisis of confidence and direction in the national team. The shadow of Cronje hung in the air throughout the captaincy of Mark Boucher and then Shaun Pollock, until, soon after the 2003 World Cup the Ginger Warrior was replaced as skipper by Smith. The scion of South African sport’s most famous family would stay on as the younger man’s senior pro, but it was apparent that the new captain would do things decidedly his own way. With the bulk and square jaw of a man that would not look out of place in the front row of his country’s rugby team, “Biff” led the charge from the front as skipper. Taking over mid-series against the Australians, he then took his team to the northern hemisphere in 2003 for a series with England. It was here that his leadership style was stamped on the cricketing world. In his 11th and 12th Tests, and in only his third and fourth as skipper, he compiled incredible double centuries which were a monument to aggression, endurance, physical strength and fitness. A hardman’s batsman in the mould of,say, Matthew Hayden, rather than an aesthete’s delight a la Gower, Zaheer, VVS Laxmann or Mark Waugh, Smith would set out to physically dominate the bowlers with that signature stroke of his: the muscular clip through mid-wicket. Also like Hayden, he was a crashing front foot destroyer of medium and fast-medium bowling. Not, it is safe to assume, that Smith could care less about gaining marks for artistic merit, for his methods were deployed in order to snuff out any hope the opposition may have had, with aesthetics being at best a secondary consideration. As his predecessor Shaun Pollock noted “I’ve got two daughters but if I had a boy, I would not want him to bat like Graeme Smith” before adding, “technically, he wasn’t the best, but from a tenacity and character point of view his record sums him up. You don’t always have to look pretty to be effective, and he was very effective”. The figures of his Test career are startling in themselves. What is truly remarkable is the sheer weight or runs scored while shouldering the burdens of leadership from such a tender age. In a career spanning 117 Test matches Smith compiled a total of 9265 at 48.25. He was captain in 109 of those Tests, scoring 8659 at 47.83 while leader. Furthermore, 25 of his 27 hundreds came during his tenure as skipper. It would have been impossible to maintain the Herculean standards of his debut England series in 2003, where he compiled 714 at 79.33 with a strike rate of 70.14. He did not dip too far from those standards, though. Playing against England invariably proved happy hunting for the man from Johannesburg. In 21 Tests against them he compiled 2051 runs at 56.97, with those twin double hundreds in 2003 being joined by five more centuries over the course of his career. If there is any personal disappointment in his career then that surely has to be his relatively modest return in Tests with Australia, against whom he played a total of 21 matches with reduced success. With a total of 1238 runs at an average of 32.57, he managed three hundreds against the best team of the first half of his era. Conversely, his high as captain must have come when recording his country’s first overseas series win against the Australians in 2008/09. It was in the concluding Test of that series in Sydney that Smith showed his true mettle and why, above all else, he is so highly rated as a brave, selfless leader of men. With South Africa going into the game with an unassailable 2-0 lead, they merely needed to avoid defeat to ensure number one spot in the world rankings. Australia eventually won the match to retain the top spot thanks to their victory in Sydney, but this seemed less than a certainty as an unlikely 9th wicket partnership between Dale Steyn and Makhaya Ntini dragged on into the last fifteen overs of the final day’s play. Although South Africa failed to land that much sought after piece of ICC minted silverware in the limited overs game, Smith’s own record was equally impressive in the abbreviated format. In 197 ODIs he notched up 6989 runs at an average of 37.98, scored at the heady rate of 80.81 per hundred balls. 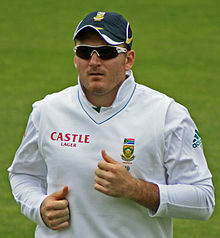 Furthermore, during his dozen year Test career South Africa won 60, drew 27 and lost only 30 matches in the elite format. It made all the difference to his team when he got his head down and scored, too. In the games his country won throughout his Test career he scored 5214 at 61.34. In the matches South Africa lost he totalled a mere 1433 at 25.58. Clearly, as was the case with his great compatriot Kallis, a substantial Smith contribution gave his team the edge. He went out of the international game as he came in: against Australia at Cape Town in matches some twelve years apart. His prodigious scoring rate, which never dipped below 52.09 per hundred balls against any Test match oppostion, is further evidence of the ways in which the game at the highest level has changed in the last couple of decades. Critics may point to the changes in Law 42 which limited the surprise element of fast, short-pitched, intimidatory bowling and which loaded the dice in the batsmen’s favour, allowing greater scope for attacking front foot play. This is certainly a valid point, although such is Smith’s tenacity and strength of body and will that it is surely conceivable that he would have had a comparable record prior to the changes in that most contested of the game’s laws. Graeme Smith leaves behind a captain’s legacy of supreme opening batsmanship allied to bold leadership from the front, conducted with more guile than he is perhaps given credit for. Along the way his leadership was also responsible for galvanising South Africa into a unit which maximised its awesome potential when it looked as if the Cronje tragedy had stripped the country of its cricketing confidence. He can be forgiven his unfathomable devotion to Liverpool FC as he sets out on his county career with Surrey, where he joins forces with another headline act from the past decade, Kevin Pietersen. As they march on in tandem, Test cricket’s loss is surely the county game’s gain. I’ve only recently started working my way thru the features on CW. iPad plus insomnia is helping me work thru them. There are some wonderful writers and informative pieces on the CW features page. Inspiring me to write something once I finish my last bit of study in a few weeks.